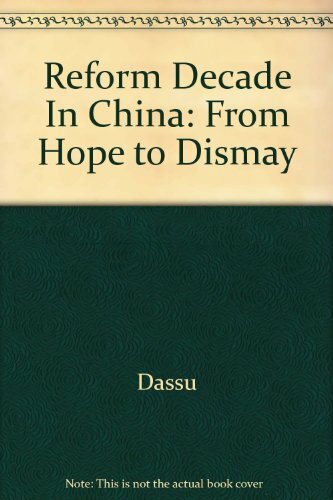 This book provides a detailed analysis of the reform programme in post-Mao China. All the authors share the view that the dramatic events that came to a head in Tianmen in June 1989 were the result of a profound crisis in the reform programme launched in 1978. The individual chapters analyze the roots of this crisis: the inability to deal sufficiently with the Maoist legacy; insufficient political reform (su Shaozi); the clash between Deng's revolution from above and society's revolution from below, and the imbalances created by the new economic programme itself (Kathleen Hartford and Yves Chevrier). Gerald Segal examines the relationship between these domestic changes and China's foreign policy. Marie-Claire Bergere provides a specific study of the causes of the Tianmen tragedy. The essays also provide a conceptual framework to help evaluate future perspectives for a country that will play a key role in the Asia Pacific region. The book should be of interest to students of contemporary China and to those concerned with the more general issues of political and economic development and reform within a state-socialist context.